ePublishing Knowledge BaseePublishing Knowledge BaseePublishing Knowledge Base Creating and Managing EventsHow do I delete an event? Note: Deleting an event is permanent. There is no undo. 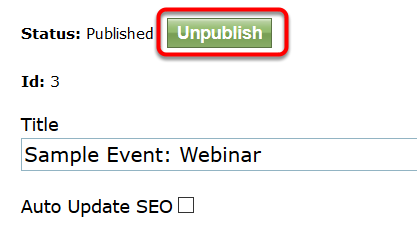 If you just want to unpublish your event, simply click Unpublish at the top of the same page. After opening your Event in the Event Manager, scroll to the bottom of the first page (Edit > General). Click Delete. Deleting an event is permanent. If you want to just unpublish your event so it no longer appears on your website, click Unpublish at the top of the page. Prev: How do I search for an event? Next: How do I remove sidebars or unrelated content on an event page?